with those we love who pass away. This story really begins when Scott was seven years old. He wanted a box turtle and he wanted to name it 'Bubba'. Scott worked very hard to earn the $40 he needed to buy Bubba. He built a cool deck with wheels to hold Bubba's glass aquarium. He kept Bubba in his bedroom at night, and each morning he would roll Bubba out to the sunlight that came in our sliding glass door during the day. name, Bubba. Scott took care of Bubba and Bubbette. He built a raised garden in our backyard when he was about thirteen years old. He loved to add elements to the turtle's habitat - like shelters made out of broken clay pots and strawberry plants to give them shade and eats. Scott would gather snails from the yard and watch Bubba and Bubbette devour them! Then in the spring of 1996, just about three months after Scott died, we were weeding the raised bed when we noticed Bubbette digging a deep hole with her back legs. She was able to dig a hole about six inches deep with her short three inch legs. And then, as if we were watching a nature show on PBS, she laid five eggs in the hole. And just like that, she filled in the hole with the pile of dirt she has removed from it. This ritual has continued each summer since 1996. In fact, Bubbette sometimes lays up to three batches of eggs. If we happen to see her laying them, we mark the area with some small stakes. Then we wait. It is odd, but Bubbette normally lays the first batch around the end of May, near Memorial Day. We normally see the first hatchlings sometime around the start of September, near Labor Day. It is almost like clock-work! He never saw Bubbette lay eggs. He never held a tiny hatchling ~ some no bigger around than a nickel. But each year, as September comes, we experience the joy of Scott's parting gifts. 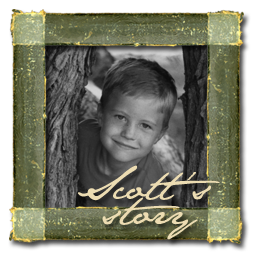 each summer and share the memory of Uncle Scott for years to come!